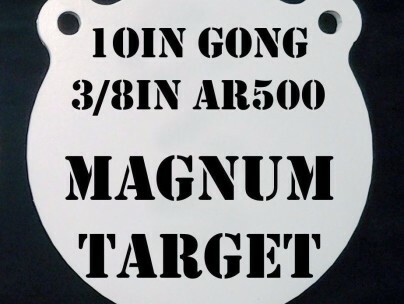 This Steel Target is great for most pistol and rifle caliber’s, including .223, 30-06 & 308 high powered rifle caliber’s. This 3/8in. thick AR500 Steel Target is rated to 3200fps@100 yards. The Steel Target includes two 5/8in. holes for Gong mounting and one square center hole for stand mounting using a 1/2in. carriage bolt. Steel Targets are precision cut with a CNC plasma cutter and submersion water-cooled during the cutting process to maintain the integrity of the steel, ensuring the longest life. Reversible target face doubles the life of the steel target. Email us at magnumtarget@gmail.com or call us at 501-503-1525 with custom quantities and sizes. Shooters and spectators must always wear proper eye and hearing protection. Recommended minimum distances from steel targets to shooter are 15 yards for pistols and 100 yards for rifles. If using non-frangible ammunition use pistol ammunition with a maximum velocity of 1500 feet per second. Rifle ammunition muzzle velocity should not exceed 3,000 feet per second. No shotgun slugs, steel bird shot and buckshot ammunition can be shot at steel targets. Never shoot hardened, steel core or armor piercing ammunition at any steel target. Do not use a steel shooting target that has been deformed or damaged. Bought this for 5.56 and 308 shooting and I have shot at 300 and 600 yards with no pitting what so ever. Great quality. And beat everybody’s prices. Will be buying another soon.